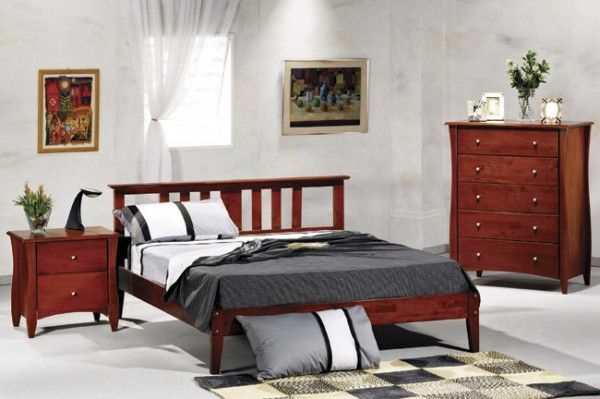 Set includes Queen size Platform Bed Frame • 5 Drawer Chest • 1 Nightstand with 2 drawers * Made of Indonesian hardwoods and veneers in Chocolate finish “shown”. 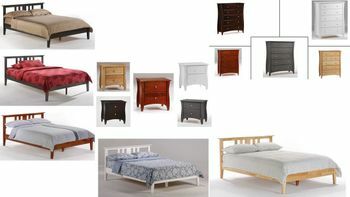 Sold as a complete set of a queen open end style platform bed, one night stand and one chest of drawers. Our "Open End" platform bed is complete with 12 solid hardwood mattress support slats, and supported down the center with our rail and foot support system. "Open End" platform bed come with our patented Thumnut™ for easy assembly of legs and rails. Headboard and low profile foot "panel" included. MATTRESS SOLD SEPARATELY. QUEEN headboard: 34 3/8" height. 63 3/8" wide x 84" long. Ground clearance 8" * Our 5 Drawer Chest pleases with its stately look, and gives you fabulous storage while taking up minimal floor space. The long curves of its tall legs may be its finest feature. Chest: 47 1/8" H x 38" W x 18.5"L. Every set comes complete with two sets of drawer knobs, to assemble per your choice, in either wood or metal (pewter finish). • Our Nightstand is a very practical accessory for your bedside with its two spacious drawers and its attractive detailing. • • Night stand: 24 1/8" H x 25" W x 18.5" L. • • Every set comes complete with two sets of drawer knobs, to assemble per your choice, in either wood or metal (pewter finish). Note- Drawers available to fit under bed. Sold in pairs for an additional charge of $135 per pair. A maximum of 2 sets (4 drawers) may be placed under the queen platform bed. A privacy panel for the foot of the bed is also optional. Other finishes available- CHERRY, CHOCOLATE and NATURAL. Other Bed sizes available TWIN, FULL and KING.